You are currently browsing the tag archive for the ‘barcamp’ tag. IVOTEL Ambohidahy (Antananarivo), organized by FOKO and Global Voice. 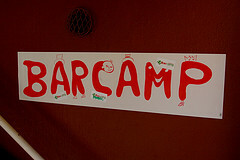 The concept of Barcamp is to gather all people keen on computer, internet, open source technologies, including bloggers. All the bloggers of Madagascar could meet then on that special day. And one by one, they shared knowledge, experiences and advice. Raberimanana, the president of Madagascar au temps tic ( a Malagasy living in Paris) was really impressed of the evolution of the Malagasy youngsters. It was so great to see the FOKO members actively taking pictures, shooting videos and instantly sharing the Barcamp news to the world. 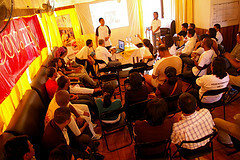 The Barcamp Madagascar was a real success. A big hand to all the organizers. Impatiently waiting for the next Barcamp Madagascar.